As soon as the weather warms up, enthusiastic members of OSBA have been gathering for a few hours each week to enjoy good company and our favourite activity: sketching outdoors! Our numbers have grown as word spread about how much fun it is. 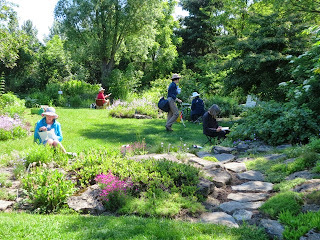 Kerri Weller got us off to a good start with her spring class on how to approach Plein Air sketching. We found it so fulfilling we wanted to continue after the classes were finished. Inga Legere is the Sketching Co-ordinator, and does a wonderful job of scheduling the location and sketch day, each week. 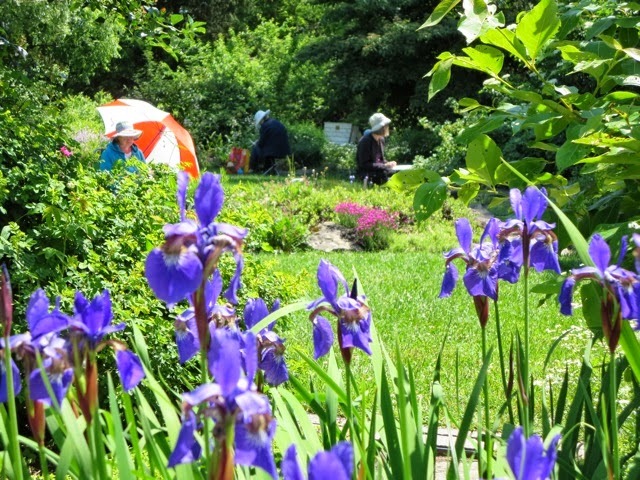 Experience has taught us the best things to bring: a low folding chair or stool for getting close to the growing plants, sun hats, sun screen, mosquito repellent and water to drink, as well as our usual art supplies. Coffee and a snack help too! Quickly we select our subjects and settle down to draw. A hush falls over the group. We become absorbed in capturing it on paper and a thrilling new world opens up. Nature comes alive for us. We become conscious of the clear air, the dappled light, the birds singing around us, the muted sounds of the city in the distance and the smell of the warm earth. For a few short hours we touch the reality of this wonderful world we live in. Our challenge is to show the beauty of the plants we sketch in hopes we can portray it to others in our artwork. We break at mid morning for coffee, and to share our work, thoughts and comments with each other. New friendships have evolved as we share our common interest. We wish to thank the volunteers of the Fletcher Wildlife Garden for their care of the gardens. A special thank you to volunteer Isabelle Nicol, Backyard Garden Manager, for making us feel so welcome. Thanks to Cecilia Martin for the great writeup!